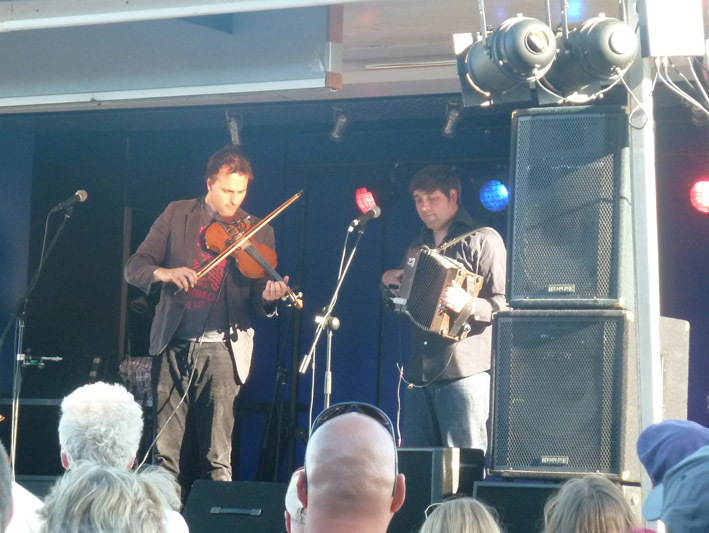 Folk on the Quay is a free festival with stages along the quay, and Spiers and Boden were the headliners. 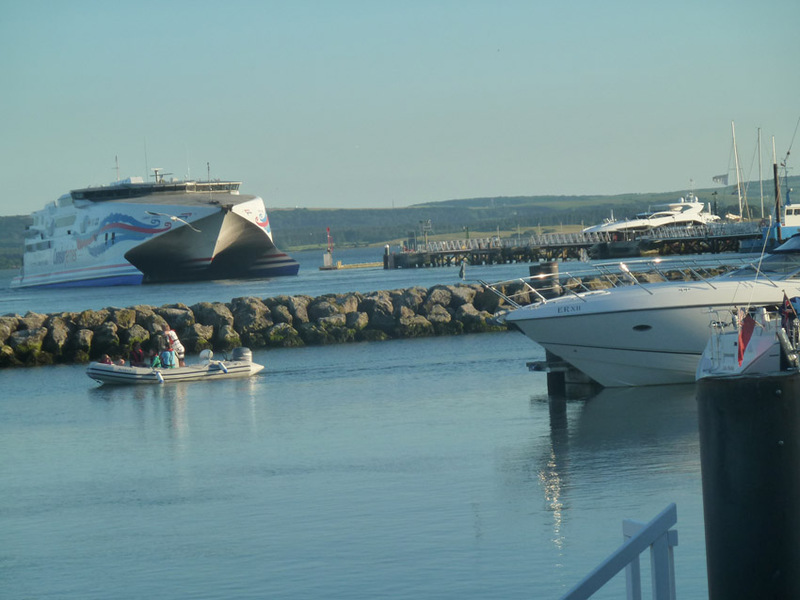 The larger stage (or rather larger audience area) was outside the dull 1980s Thistle Hotel, thus denying them one of the best views in England which was behind them, across the harbour to Brownsea Island and the Purbecks. 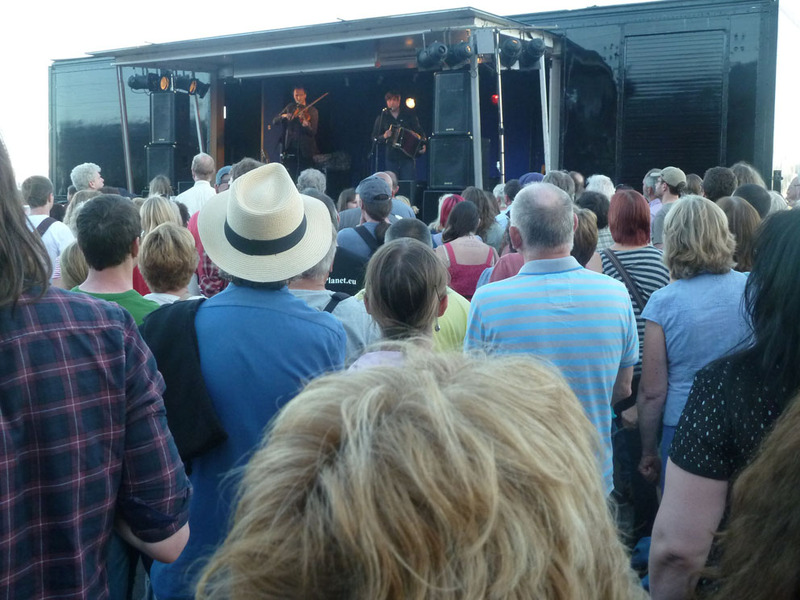 They had to face the modern brick hotel … the smaller stage had views of the historic pubs and warehouses. You’d expect a sea shanty laden set by the harbour, and we got it. Poole was home to pressgangs, privateeering, piracy and smuggling in its day. Now the boats behind them were large luxury motor yachts, but perhaps the merchant banking classes are just another variety of pirate. The first vocal,the pirate sea shanty Captain Ward had an appropriate setting. Having seen Spiers & Boden twice, and The Demon Barbers twice, I’ve heard that song live four times this year. It’s always fun, but the smell of the sea helps. As soon as pirates were mentioned by Jon Boden a couple of dozen “Ooh, Ahrs!” broke out from the crowd, but that’s how we sound down here anyway. It was the bluest sky of this year. 23 degrees when I parked the car at six, still 22 degrees when I moved it at eight fifteen, so one of the balmiest evenings of the last few years. The forecast, obviously, had been rain. It was only five weeks since I last saw them (LINK to review at Forest Arts, New Milton), and the set was similar, though I was delighted to get Bold Sir Rylas, Adieu Sweet Lovely Nancy and Old Maui this time. Bold Sir Rylas with its chorus in three seperate lines went down extremely well, the loudest applause of the main set. John Spiers was leading the chorus. Adieu Sweet Lovely Nancy was new to me (it’s a Copper Family song) and I Googled it and found it’s on an early Spiers & Boden album I don’t have: Through & Through so that’s one to add. It has been unavailable since 2010, and fortuitously is due for re-release on July 8th this year … they’re slipping. That was definitely one to announce from the stage, especially as the second encore, Rochdale Coconut Dance is from the same album, though in that case it re-appeared on The Works collection.I put my amazon order in while doing this review. The earlier review is so recent that it’s the place to read more about instrumentation and songs. 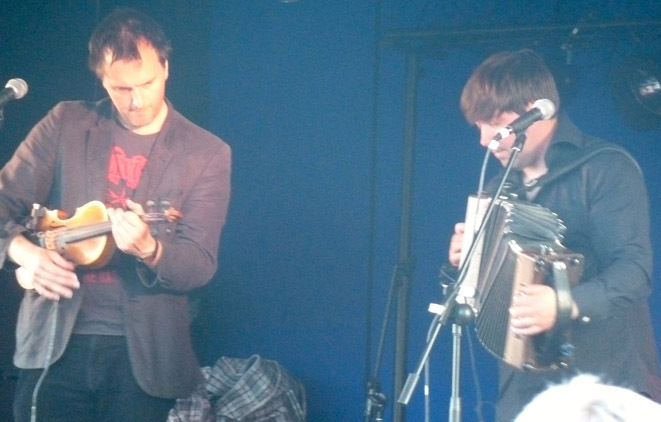 They were also in Poole in February with Bellowhead (reviewed here). Jon Boden stressed the traditional nature of their repertoire, but around me everyone seemed to know their material well. 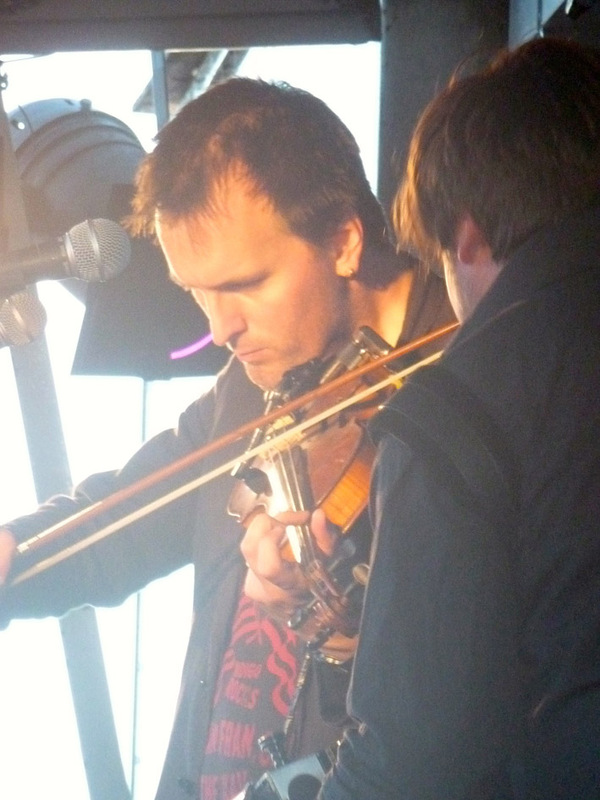 Everyone loved Jon Boden’s extended plinkety-plink single note violin solo, holding it like a guitar. The outdoor setting, balmy evening, several hundred in the crowd, lots of dancing, great applause all seemed to feed back on their own enjoyment of the set. It must be highly-gratifying to have half a large crowd singing along to New York Girls. The open air setting and sound is immediately different to the intimacy of Forest Arts last time, but it suited the jigs and reels. The first instrumental had a large dog barking along, but it adds to the mood. I’m getting used to the “tunes” in sets of three, even if they announced Three Tunes had actually been four. This year, Bellowhead, Jon Boden solo and Spiers & Boden have dominated my listening. A fine set on a fine evening, and a mere eight to ten minute drive from my house in my home town. July 1st on Monday. Time to download my monthly installment of Jon Boden’s “Folk Song A Day” project where he recorded a song for every day of the year … only available as a download, and I’m taking it in monthly portions.